When you rearrange furniture, everything old is new again. Is your living room less than lively? Chances are your seemingly stale room already contains all the right elements to make it warm and vibrant. Rearranging furniture may be that all it needs is to pull it all together. 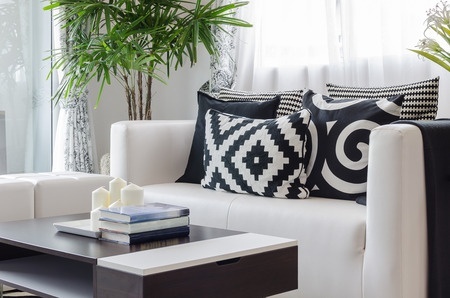 These designer-inspired strategies tips for rearranging furniture can help you make the most of what you already have in your home. Even the most beautiful furnishings won't work together if they're not arranged in a way that beckons you to come in and sit a spell. Mix things up for warm touches that unite the past and present, such as an antique side table paired up with a comfy new sofa. The idea is not to adhere slavishly to a particular style or era - such as Victorian or Mission - but to project your own taste and personality. After all, who really wants a room that looks as if everything arrived on the same delivery truck? 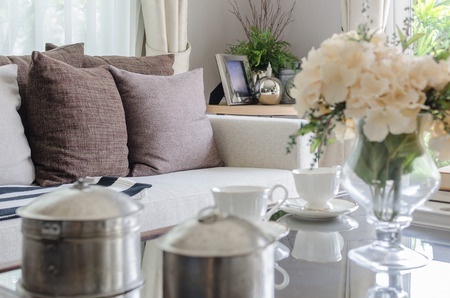 When it comes to interior design, the number one rule is that the arrangement of a room's contents is nearly as important as the contents themselves. To create a sense of depth and softness, you should position furniture at an angle or floating away from the wall. This makes the room feel less boxy, more intimate and inviting. Start by placing the largest piece, usually the sofa, so it faces the room's main focal point, such as a window with a view or a fireplace. Next, group the rest of the seating a maximum of 10 feet (3m) from the sofa - farther away makes conversation while seated difficult. Balance pieces of a similar size by placing them across from each other. For example, a pair of upholstered chairs placed opposite the sofa will provide a better balance than would a pair of delicate wooden chairs. Within your conversational circle, allow 3 feet (1m) between pieces for easy traffic flow into and out of the seating area. Position major elements on separate walls; the television will be more prominent it it isn't right next to the fireplace. Place darker pieces where they'll get the most light, by a window or floor lamp - a dark cabinet will disappear in a dimly lit corner. If the room is large, set up a secondary area to make the room feel cozier and do double duty: Add a desk and chair to a window corner, or create a family game area with a small table and a few chairs. Now that you've got the foundation - your furniture - in place, it's time to consider the placement of your decorative objects. Your collections, artwork, and photographs are the elements that project your personality into a room. Why not show them off as a designer would, making the most of each piece of furniture? Start with the walls. Is your picture arrangement boring? Consider rehanging your wall treasures in asymmetrical groupings rather than in straightforward rows; this creates a sense of drama. Place the bottom edge of the lowest piece 6 to 8 inches (15-20 cm) above the top of the furniture; work upward from there, going as high as you like. Hang petite groupings behind a dainty table or chair, a large single pictures in back of your ample sofa. A multitude of tiny treasures spread about a room may seem homey, but the overall effect is usually unfocused rather than appealing. Instead, group items that have a similar texture, shape, or theme together on shelves, on a coffee table or end table, atop the armoire - and leave a hand's breadth or more of space between each grouping for maximum effect. Finally, take a tip from designers themselves: Any room quickly becomes both brighter and more inviting when you add a cozy throw blanket, a sparkling crystal vase or sculpture, or a polished brass or gilded picture frame.